When was the last time you asked someone about their process – how they do what it is they do? Be it your doctor, your hairdresser, your barista, your paralegal or your marketing consultant, everyone has a process, and there is always something to be gained by learning about the processes of others. Next question: When was the last time you examined your own process? Even though we are all extremely busy, it’s crucial to periodically analyze and improve your business process, since the way we do things generates and defines our final outcomes. Without a quality process, it’s nearly impossible to achieve a quality outcome, whether that process pertains to the work of your lawyers or the work of your legal marketers. Legal Lean Sigma® Institute CEO and founder Catherine Alman MacDonagh, a former corporate counsel and law firm executive, addressed this topic at the Capital Chapter Legal Marketing Association luncheon in Washington, DC, on September 14. Her engaging presentation, “An Introduction to Legal Lean Sigma® & Effective Project Management,” provided an overview of process improvement and its benefits: efficiency, value, predictability, consistency and quality. “If you can’t explain your process to me, then I’m not going to trust you,” MacDonagh said at the luncheon. That’s a powerful statement and one that likely resonates with each of us. Consider how it pertains to your own life: Do you trust a doctor who can’t explain a surgical procedure you are about to undergo? Do you hire a consultant who can’t explain the process used to deliver a service? The same is true for you and your colleagues, clients, prospective clients and target media. After all, we make our decisions largely based on trust, and if someone does not know their own business process well enough to explain it, trust is rightfully diminished. Define - Define the problem and why it has to be solved. Measure - Measure the current performance of the process. Analyze - Analyze the opportunities to reduce waste or variation. 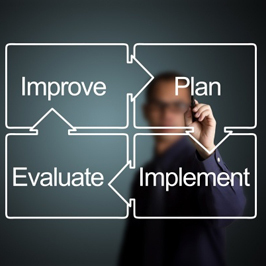 Improve - Improve the process by identifying, implementing and validating process changes. Control - Control the process by implementing methods to ensure that improvements are sustainable and anticipated benefits are delivered. For many, it’s difficult to embark on the process improvement journey because they feel entirely too busy. In reality, it’s a journey you can’t afford to avoid. MacDonagh calls this “The Fire-Fighting Doom Loop.” Due to time constraints and deadlines, a law firm never takes on process improvement measures, thus it cannot adequately perform at the levels required. Issues, errors and delays ensue, ultimately resulting in needing increased staffing and time to investigate and pacify. MacDonagh notes that process improvement can be leveraged more fully when performed in conjunction with successful project management. Project management, at its core, involves using your best processes appropriately for a given project. However, few legal marketers or attorneys have formal training in project management, so it’s advantageous to rely on proven best practices. To that end, you can refer to Jaffe CRM Manager Jennifer Faivre’s valuable project management tips, as well as Jaffe Content Strategist Keith Ecker’s insight on the latest project management technology. In the legal industry, all work – from litigation and e-discovery to marketing, public relations and event planning – has a process. An effective and finely tuned process will result in favorable outcomes for your clients, your colleagues and you. “Think holistically about every opportunity you have to positively impact those around you,” MacDonagh said. If you would like to share your own process improvement and project management successes, or discuss specific ideas for your marketing and PR efforts, do not hesitate to contact me, Bethany Early, at bearly@jaffepr.com. Vice President, Public Relations - Uses savvy intuition to develop thoughtful, creative communications solutions that ease clients’ marketing concerns. Break Free from Your PR and Marketing Rut!